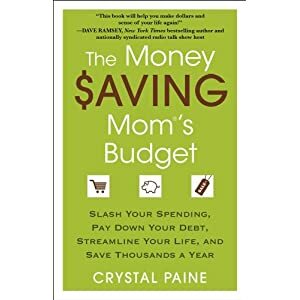 I was recently given the opportunity to review the book, The Money Saving Mom’s Budget by Crystal Paine. I have followed www.moneysavingmom.com for several years, now, and I was excited to hear that the blogger-turned-author was entering into the foray of books. #1- Set big goals and break them down into bite-sized pieces. #2- Streamline your life and cut the clutter. #3- Set up a realistic, workable budget. #4- Take the cash-only challenge. The rules are not always easy and there is no “easy road” to financial freedom. However, while reading this book, you can really get a sense of how real and tangible the sacrifice and perseverance Crystal and her husband endure on their own road to financial freedom and paying 100% cash for their first home. In conclusion, I would recommend this book to anybody- not just moms- looking for ways to reevaluate their finances and household budget. We could all use a little “tune-up” when it comes to our money and this book is just one way to go ahead and do so!